A range of bedroom wardrobes including combination (linen press) wardrobe units, corner wardrobes, corner stable wardrobes, diagonal and angled wardrobe units. 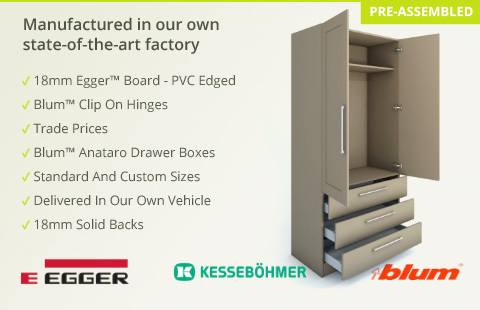 These high quality wardrobe units are made from colour coordinated 18mm Egger board, available in a wide range of finishes to suit every bedroom refurbishment project. These bedroom wardrobes are manufactured to order using the latest technologies and techniques. Drawer units are supplied as Blum Tandembox soft close drawer boxes and runners as standard. Bedroom wardrobe units are supplied flat packed for convenience.